Game design isn’t often decided by democracy. 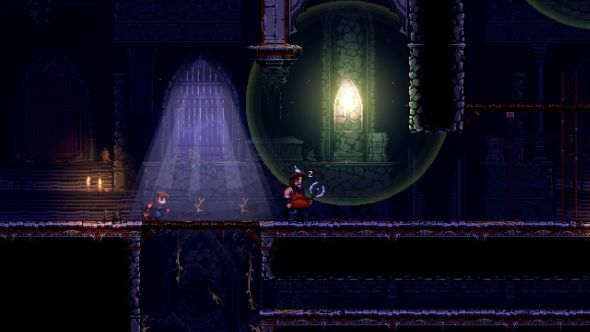 Sure, the new Torment game’s combat will be turn-based because backers voted as such, but that’s the exception – games are made by teams, and teams need direction. UK indies Cardboard Sword, however, have found a way to satisfy everyone. They only had to invent a new genre to do it. In the interests of word association, why not pick out a great sandbox game while you’re here? 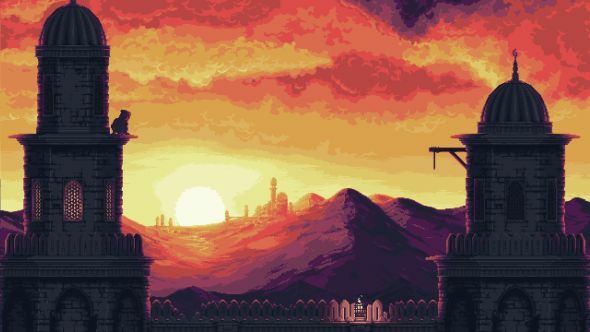 The Siege and the Sandfox is a Steathvania adventure, then – the first of its kind. As a thief caught padding around a royal palace, you’re falsely accused of regicide and thrown into the dungeons. In escaping you come to know its cavernous, sandy ruins, bypassing prison guards and possessed sand immortals in pursuit of power-ups to your abilities. As in any ‘vania worth its salt, new abilities in The Siege and the Sandfox unlock areas previously blocked by your own inexperience. How does one go about combining that tradition with tricksy stealth? Cardboard Sword plan to strip the genre of on-screen minimaps and awareness indicators and leave players only with the behaviour and body language of their enemies. Instead you’ll be evading. Line of sight will matter but so too will audio, with different surface materials and movement speed affecting what sort of racket you make. Your thief can jump far and high, running up and off walls and swinging on poles. “Imagine a parkour Flashback with the rhythm of Mirror’s Edge,” suggests Bennett. 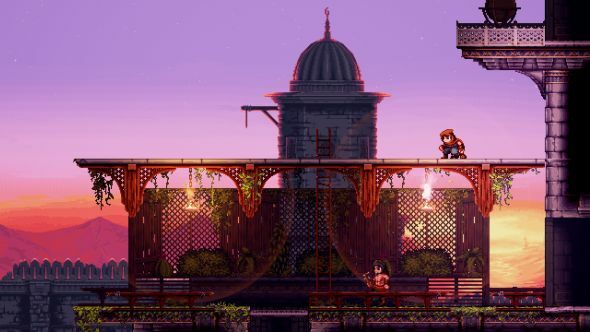 Mark of the Ninja is a touchpoint for flattening stealth onto a single plane without losing its nuance, while the team are equally fond of Looking Glass’ Thief games for their logical level design. Cardboard Sword intend for The Siege and the Sandfox’s environments to allow for multiple, emergent routes, and above all to feel real. To that end, it helps that the project has coalesced around an alluringly dense and gothic art style. The team’s two artists, Ed and Keith Duke-Cox, created the world of The Siege and the Sandfox as a hobby project and unveiled it to the studio soon after joining up. Their work became the canon that the team – made up largely of Frontier Developments and Little Big Planet Vita veterans – wrote and designed around. 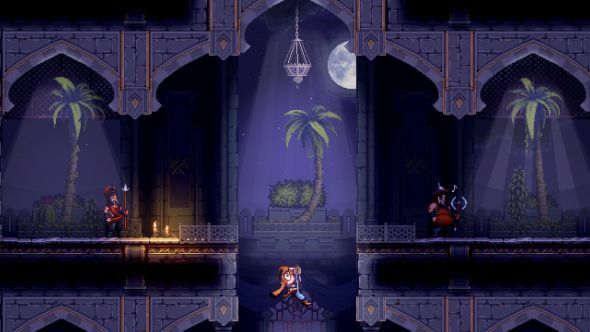 The Duke-Cox’s fantasy kingdom draws architectural inspiration from various cultures and points in history, but there’s a touch of Prince of Persia about its tall windows and torchlit stone corridors, and more than a grain of Indiana Jones and Uncharted in its dusty depths. Cardboard Sword have exploited the visual effects potential of Unreal Engine 4, which they picked to take advantage of the team’s existing skills. The studio are now working with Talespinners, an outsource writing outfit who contributed to SOMA and Frozen Synapse Prime, on a story and informal quest structure for their sprawling dungeon. Beyond that, they’re looking for a publisher. Cardboard Sword can’t always make everyone happy. Often democracy finds them disagreeing, each fighting their own corners, before choosing the most reasoned perspective on how to proceed. Something they can all agree on, though, is the intense artistry of their gothic palace. Find out more on The Siege and the Sandfox’s official site. Unreal Engine 4 development is now free. In this sponsored series, we’re looking at how game developers are taking advantage of Unreal Engine 4 to create a new generation of PC games. With thanks to Epic Games and Cardboard Sword.